These colors are not my normal pastels...but they are festive and make me think of dancing. Well, of other folks dancing...as my own efforts are not very festive...more like "somebody get a doctor". These are the colors requested by Shelly for her set of fan blocks. As you can see above, I'm only laid down some base stitches and trims so far. Lot's more to do. But, today...I thought I share the other blocks already stitched in this set of round robin blocks.The ladies stitching before me have done a great job and I'll try to create a fourth fan block that works well with their fans. 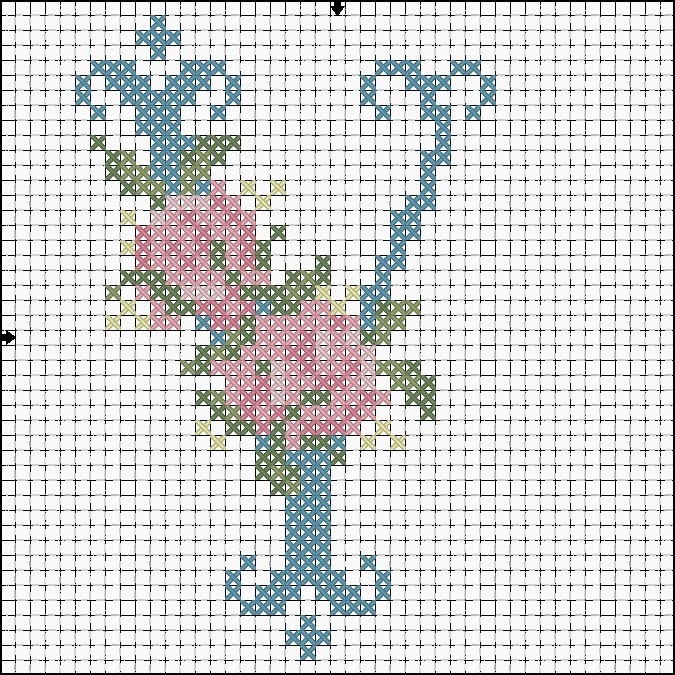 This one was stitched by Ritva in Finland. She has very delicate stitching and I love the orange and yellow tatting piece! 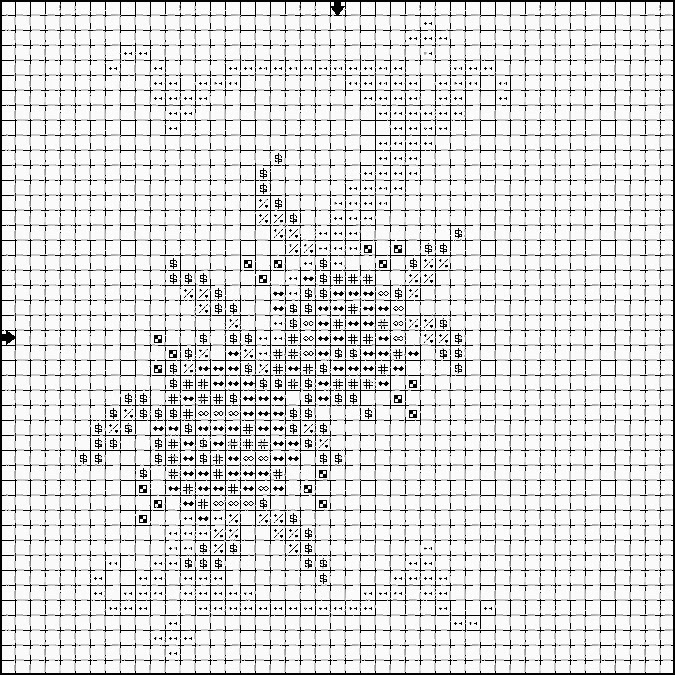 This one was stitched by Colleen in Nebraska, USA. The symetry of her work in this is just beautiful and I'm wishing I had a bucket full of those lime green buttons. 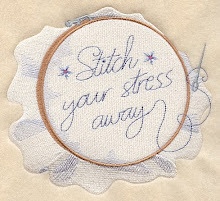 And this last one was stitched by NickiLee in Massachusetts, USA. She used some really pretty trims but my favorite part is that button cabochon...(yes, you know I love those!) I'll be back with more when my stitching is completed. The symbol/color legend is at the start of this Monogram Monday segment...use the sidebar tags to go to all of the letters posted so far. 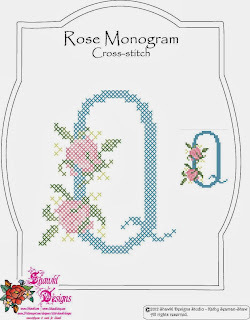 Or, instead of waiting, purchase the pdf file of all monograms in this cross-stitch Rose Monogram series from my craftsy site for a small fee. Today, unexpectedly...I got to cuddle little Brady. That's an odd thing to do on a Saturday as he is home with his mom and dad...but both had things that needed to be done today and so I got to entertain him. I love it...but it does cut into my stitching time. 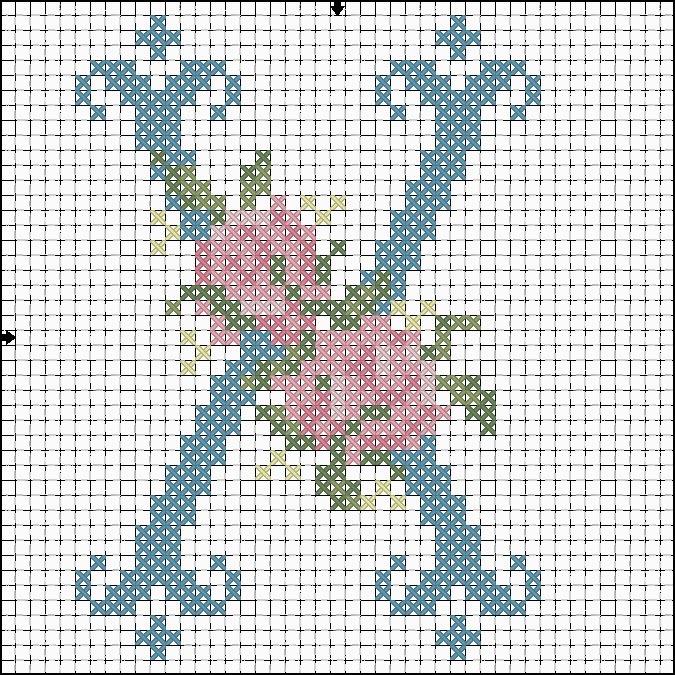 I managed to accomplish one bit of stitching this week...a pitiful small thing...but I thought you'd like to see how the cross-stitch Rose Monograms stitch up...so here is the "T". 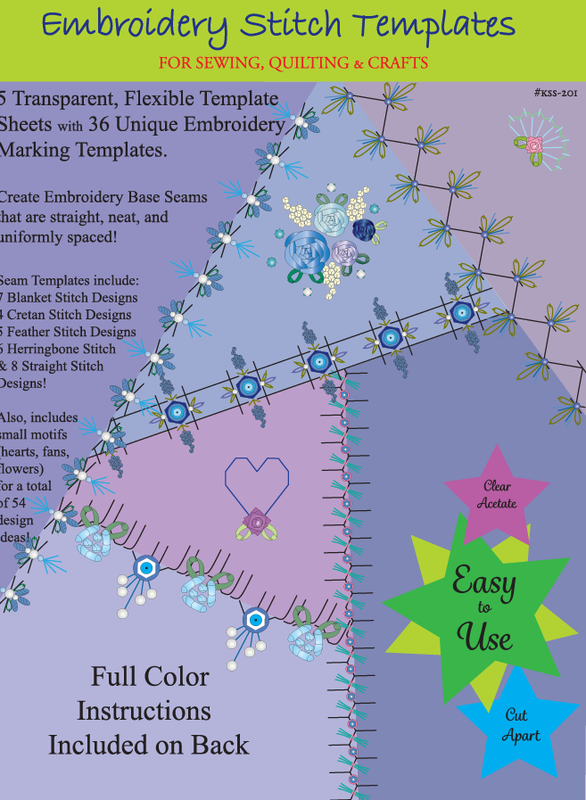 I also managed to assemble all of the charts into a single pdf file that can be downloaded on my Craftsy site (link at top right at the side bar). The file contains full color charts and B/W symbol charts for all Capital Letter Monograms so it works regardless of the type of printer you have available to you. 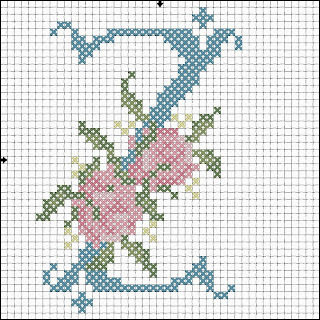 The pattern is $5.00 and if you don't like to use your credit card or paypal for little things like this...you can mail the funds to me along with the email address you want me to send the file to. 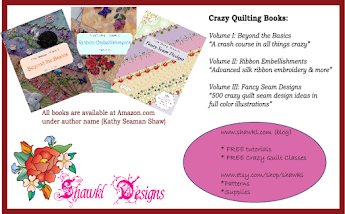 Send me an email at shaw.kathy@yahoo.com and I'll give you my mailing address if you don't already have it. Sending hugs! Here's the next Monday Monogram...this time the letter "Y". The floss colors remain the same as the "Z" posted on the first monday. Or, you can use your choice of three shades of color for the rose, two shades of green for the leaves, white or a pale color (or beads) for the baby's breath, and a single color for the initial to match your own decor or style. Today begins a new series on the blog...Monogram Mondays. Each week, (hopefully on Monday) I'll post a new monogram for you. 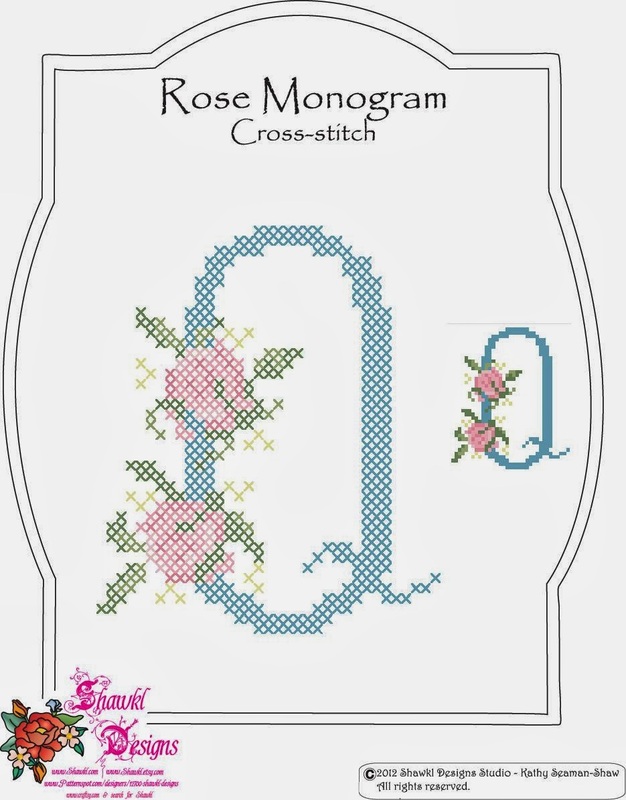 The first series is already designed and will be cross-stitch capital letters with roses and baby's breath (or beads). 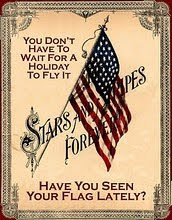 The color chart and the symbol chart will be posted. Legends for both will also be included. These will all be photos and you should be able to left click and save the image to your computer. I recommend that you set up a folder just for Monogram Monday Shawkl so that you can put them where you can find them....just saying! Hope you enjoy this series. As is my current practice...I'll be combining all of the monogram files into a pdf file that will be available on my Craftsy page...after the holidays (I'll work to get it done sooner, but no promises). 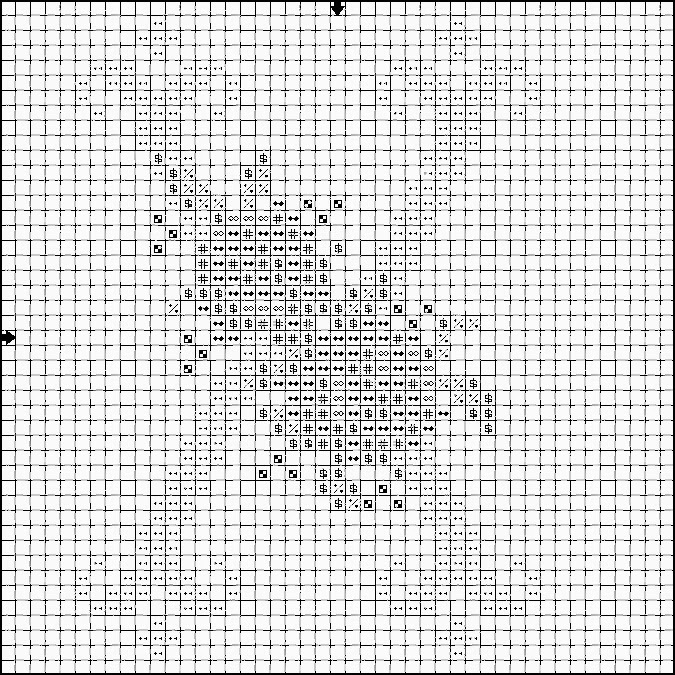 Of course, I'll post here and let you know when the set of patterns is available that way. Or...just stay tuned and download each photo free as individual files over the next few months. This week, I've been working to get a red-work quilt constructed of the embroidery blocks sent to me from my friend Judy in Mississippi. Here is the progress...all that is needed is a red border. I also made some lovely chicken, mushroom, and spinach crepes yesterday...but ate them before taking a photo! They were yummy. I love crepes but rarely think of making them...so these were a real treat for me. 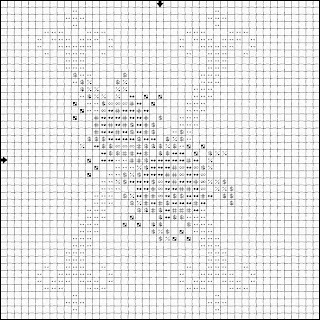 Check back with me tomorrow...because I'm starting a new series of cross-stitch patterns just for the blog...and hope you will enjoy them! For next year's crazy quilt challenge, I'm working with octogon shaped blocks and square setting blocks. 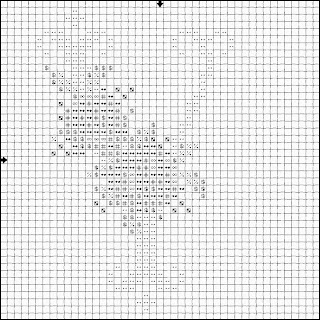 My blocks all have fairies silkies in the center, thanks to the generosity of a wonderful artist and cyber friend...Annette. Fairies are a very special topic for Annette, who does wonderful watercolor paintings...you can check them all out at her website ArtImagesByAnnette or on her blog AnnetteGraves. They are just wonderful. These are a few of the blocks, as I could not stop piecing them! 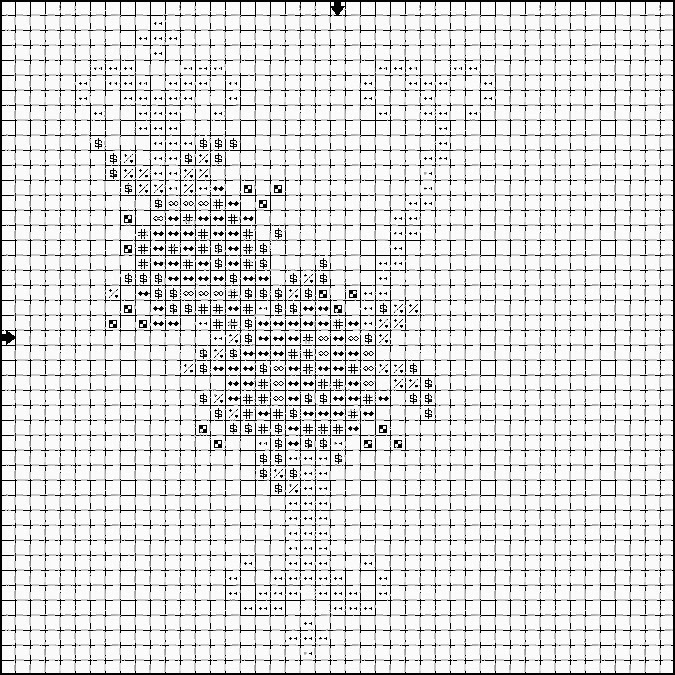 In total there will be sixteen octogons and squares. There will need to be more squares made, but they are super quick...just one piece of fabric, ha! 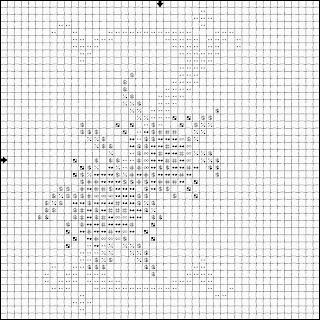 The challenge of the squares is that the stitching area is only about an inch of space! Not much stitching goes into an inch...and I'm thinking just a wee bullion rose might be enough...perhaps different colors for each block? So, you'll be seeing the progression of these blocks as the new year begins...for now, it's back to stitching on the blocks for this year which are not finished yet! I'm thinking that it will be late into next year before I get this year caught up! Good day to all...thought I'd do a little catching up. Last Sunday we had our family gathering for Thanksgiving, and it was a full house! No time for running upstairs for a camera...but I did get a photo earlier in the morning of Aidan making her fruit salad. This is the first year that she got her name on the "list" of cooks and what they were bringing. Pretty good for a ten-year old. She washed, cleaned, and cut up all of the fruit. We put it into a pretty clear glass bowl...but she mixed in my ceramic white pot so everything could be stirred up without it going all over the counter....which as you can see from the photo is really tiny. My friend Judy from Meridian sent me some lovely redwork embroidery blocks...and I've been having a lovely couple of days turning them into quilt blocks. I'm still thinking what the sashing and border will be...so that will be for a later post. And, an update on my precious little ward during the day...he is sitting up on his own now! But, I still pile pillows behind him just in case he were to topple over. He loves standing and sitting...but just does not want to crawl. He seriously detests being on his belly for more than three seconds...I think he might just decide to pull up and walk instead of every crawl! Boy, when that day comes...I've be one tired great-aunt then! Ha!